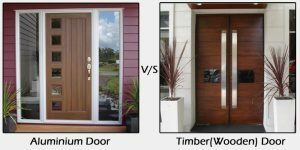 One of the most contested debates among door manufacturers, supplier and of course buyers is – Which type of door is better – Aluminium or Timber? I must say both have their own advantages and disadvantages. But when both weighed in the balance, the only winner is the consumer, who has the opportunity to choose the best according to the taste and needs. Here I am trying to bring some important facts about both door types, which can help you choose the right one based on your need. Aesthetic appeal is the strongest plus point of wooden doors, its classic designs make them perfect for period properties. The aestheticism in wooden doors gives them the crowning touch which is the demand of the traditional and contemporary appearance. Both aluminium and timber doors are long lasting if installed and maintained correctly. I would say aluminium has much more durability and strength compared to wooden doors. Some statistics say that aluminium doors are used around 74% in residential and 90% in commercial applications! Aluminium doors can be made in many different shapes and sizes due to its strength and are ideal for large windows and doors combination. Timber doors require higher maintenance as well as occasional repairing and resealing. If not maintained regularly their life reduces dramatically depending on the type of timber used. Aluminium doors are considered robust and almost maintenance free! Another factor in favor of aluminium door is powder coating. It doesn’t discolor, rust or peel and make it the perfect choice for modern homes. The aluminium doors can even be colored to give a timber effect for natural look! Wooden doors require repainting time to time. Thermal Insulation: Timber is a very good insulator and helps to maintain the thermal efficiency of the property in winter and summer season. Aluminium doors are just opposite, But by using high-performance glazing and a warm edge spacer, thermal efficiency of aluminum doors can be improved. Aluminium Doors Melbourne are cost-effective compared to timber. The overall installation cost is also less. The Aluminium is infinitely recyclable and use just 5% of the total energy to produce it from raw materials. In fact, the 70% of aluminum ever produced is still in use today. While with the timber it is completely opposite. Timber is purely non-recyclable and on an average to prepare a single pair of the door and windows one tree is destroyed! Imperial Aluminium manufactures Aluminium Windows and Doors and supplies in Melbourne. Call Us On 03 9749 7115 or Contact us to Get a Free Quote.